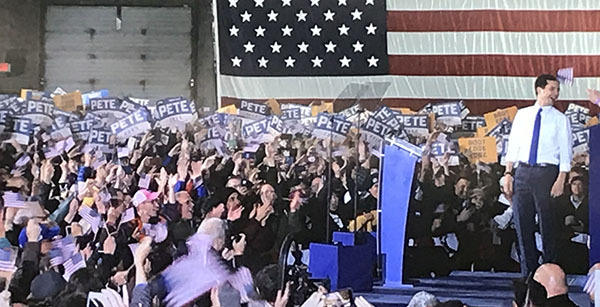 SOUTH BEND - Framed in a hulking, leaking Studebaker factory building that is being transformed into a tech center, South Bend Mayor Pete Buttigieg launched his improbable Democratic presidential campaign, declaring that the party doesn't need to just win an election, "It needs to win an era." "Once in this city, we housed companies that helped power America into the 20th Century," Buttigieg told the packed room as a heavy rain pounded outside, though he never mentioned President Trump or Vice President Pence during the speech, referencing only the "horror show in Washington." "Think of the forces that built the building we’re standing in now, and countless others like it now long gone. Think of the wealth created here. Think of the thousands of workers who came here every day, and the thousands of families they provided for. And think of what it must have been like in 1963 when the great Studebaker auto company collapsed and the shock brought this city to its knees. "Buildings like this one fell quiet, and acres of land around us slowly became a rust-scape of industrial decline, collapsing factories everywhere," the 37-year-old mayor said. "For the next half-century it took heroic efforts just to keep our city running, while our population shrank, and young people like me grew up believing the only way to a good life was to get out. Many of us did. But then some of us came back. We wanted things to change around here. And when the national press called us a dying city at the beginning of this decade, we took it as a call to arms. I ran for mayor in 2011 knowing that nothing like Studebaker would ever come back—but believing that we would, our city would, if we had the courage to reimagine our future. And now, I can confidently say that South Bend is back." "It’s time to walk away from the politics of the past, and toward something totally different," the mayor said as rays of sunlight suddenly poured through the glass windows atop the ceiling. "So that’s why I’m here today, joining you to make a little news: My name is Pete Buttigieg. They call me Mayor Pete. I am a proud son of South Bend, Indiana. And I am running for President of the United States." South Bend is now the metaphor for one of 20 Democratic presidential campaigns, which now finds Buttigieg placing third in polls in Iowa and New Hampshire. "The forces of change in our country today are tectonic," he said. "Forces that help to explain what made this current presidency even possible. That’s why, this time, it’s not just about winning an election—it’s about winning an era." Buttigieg described his campaign which has raised more than $7 million as one with the "principles that will guide my campaign are simple enough to fit on a bumper sticker: freedom, security, and democracy." As for freedom, Buttigieg said, "Health care is freedom, because you’re not free if you can’t start a small business because leaving your job would mean losing your health care. Consumer protection is freedom, because you’re not free if you can’t sue your credit card company even after they get caught ripping you off. Racial justice is freedom, because you’re not free if there is a veil of mistrust between a person of color and the officers who are sworn to keep us safe. "Empowering teachers means freedom, because you’re not free in your own classroom if your ability to do your job is reduced to a test score," he continued. "Women’s equality is freedom, because you’re not free if your reproductive health choices are dictated by male politicians or bosses. Organized labor sows freedom, because you’re not free if you can’t organize for a fair day’s pay for a good day’s work. "And take it from Chasten and me, you are certainly not free if a county clerk gets to tell you who you ought to marry based on their political beliefs," he said. Toward the end of his speech, Buttigieg described the "the horror show in Washington" as one that "is mesmerizing, all-consuming. But starting today, we are going to change the channel. Sometimes a dark moment brings out the best in us. What is good in us. Dare I say, what is great in us. I believe in American greatness. I believe in American values. And I believe that we can guide this country and one another to a better place." Buttigieg will take his campaign to New York on Monday where he'll appear on Rachel Maddow's MSNBC show tonight and then to Iowa later in the week. He's already made the Democratic debate cut, which means he'll take the stage for a series of 12 debates beginning in June. That is where the top tier of the Democratic nomination will begin to separate." Sunday was the official declaration. The rest of this calendar year will help define how probable the Buttigieg campaign really is.